EZ-Wash was established in 2015. We are a full service laundromat with plenty of convenient, well lit parking. We provide a wash, dry & fold service. We offer a clean, hygienic, and economic self-service facility. We invite you to experience our bright, air conditioned, new laundromat. Our environmentally friendly machines accept both coins and credit/debit cards. We have a staff member present at all times to assist you with your needs. We have folding tables, rolling baskets and comfortable seating. We even have a children’s table with crayons & coloring books! To offer a clean, hygienic, and economic self-service facility. Our clean, bright and air conditioned facilities are equipped with everything you need to get the job done. As our tagline says - “Laundry Made Easy”. 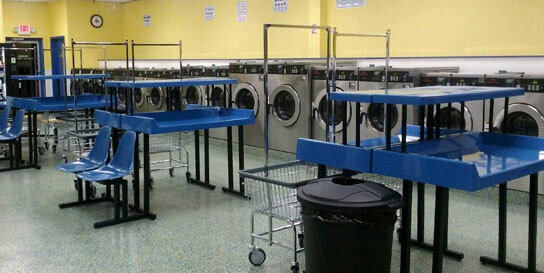 We are not only a full service laundromat but a laundromat equipped with a full service staff ready to help make your laundry experience pleasant in a modern, new facility.